We are happy to welcome our guests on our squash courts. Rackets are available for rent and we can also provide you with a ball. Also, feel free to test your skills at one of our amateur tournaments! 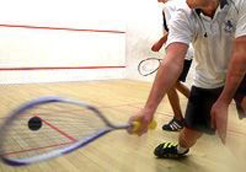 Squash is an indoor sport played with tennis-like rackets and a rubber ball, in a special court. The usual game involves two players, but it can also be played 2 vs 2. The court is 9.75 m long and 6.4 m wide. The rules of this game are based on fairplay, sportmanship and elegance. The shoes should have bright soles, the players wear shorts and t-shirts. Cursing loudly or abusing the opponent is strictly forbidden. Reserving a squash court s only possible with a valid day pass or monthly pass, in advance of 30 days. On weekends any type of pass is applicable. Reserving in advance may be cancelled at least 24 hours before the actual time, otherwise the pass will be charged. Squash passes are valid for 60 days! If you do not have a racket but would like to try squash, you can rent both in our gym! 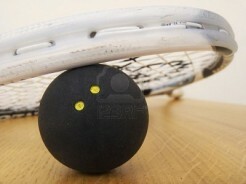 We sell all kinds of squash equipment on site! Squash tickets and passes are for using the courts, however facilities like locker room usage and other accompanying services may only be used by the holder of the pass and one additional guest. If more than two people use the court, they may not use the above services without additional passes / tickets.